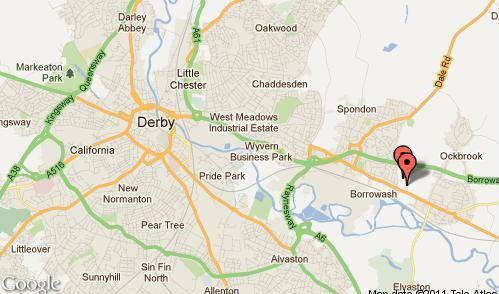 Borrowash Victoria are one of two teams who play next to each other in the Derby suburb of Spondon. 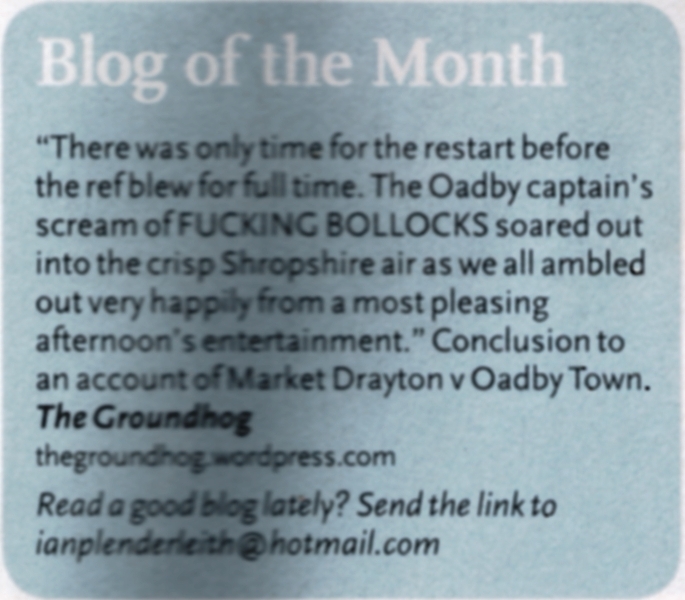 The other team in this binary star system, in a remote spiral arm of the Derbyshire galaxy, is Graham Street Prims; who play in the same league. Both grounds are accessed through the same entrance with Prims on the left and Borrowash slightly further on, down the gravel car park. They are less than a javelin throw away from each other. Both teams were at home this afternoon and you could occasionally see the ball from the other game arcing in the air above the Borrowash stand. 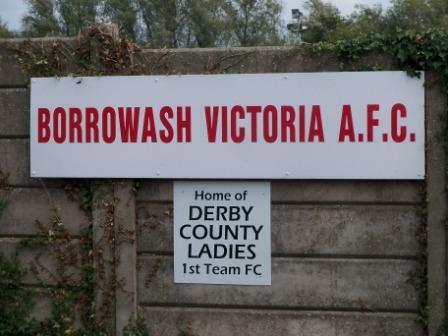 Borrowash Victoria are founder members of the joint newest step six league – the East Midlands Counties League. 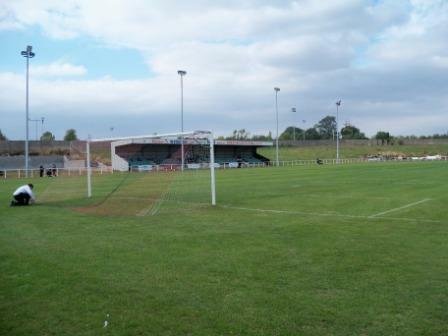 This started in 2008-09, an amalgamation of the best equipped teams from the Leicestershire League and Central Midlands League and two from the Northern Counties East League – Borrowash and Gedling Town. 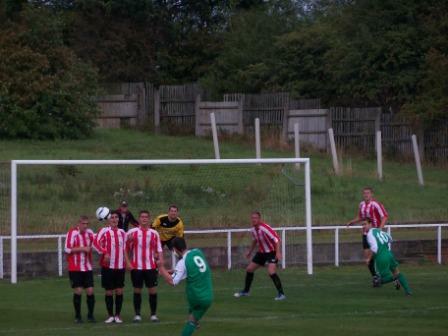 Borrowash almost got promoted last season, finishing as runners up, and expect to do well again this year. Their ground was well beyond my expectations – this is a club equipped to rise up a few divisions yet, comfortably exceeding the requirements for step four, let alone six. The name suggests something a bit grand, sounding more like an American football stadium – the Watkinson Construction Bowl. The bowl title refers to half the ground sitting under a steep bank. 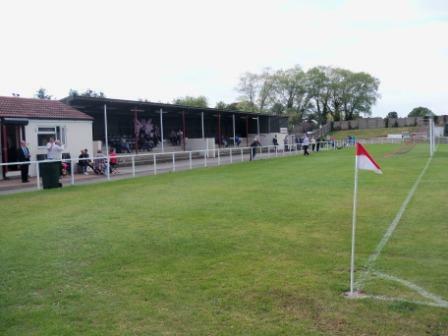 The main stand, seating around 200, sits beneath this bank, which then winds round behind one goal. If the game was really boring you could climb up the steep slope, shin up the wall and watch the Prims next door. 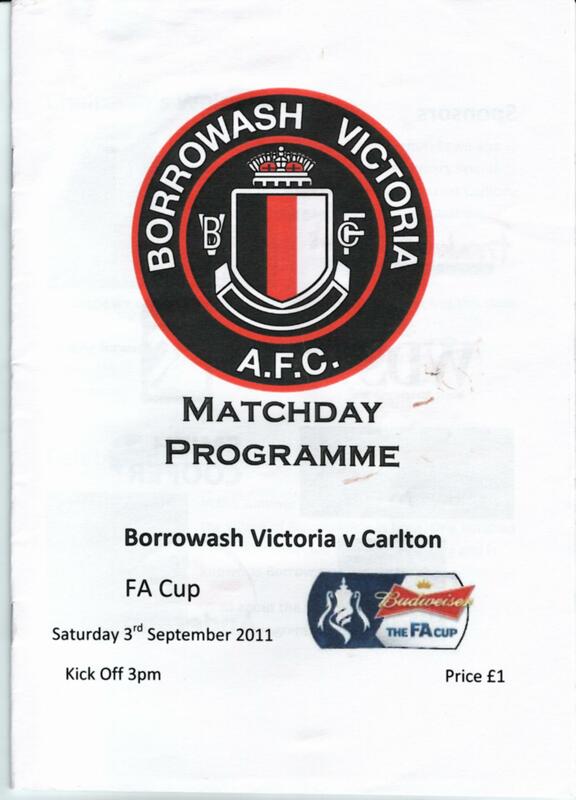 The visitors for this FA Cup tie were Carlton Town, two divisions above in the Evostik Div One North. Carlton Town were recently called Sneinton, and have enjoyed a rapid rise up the divisions in recent years. Carlton put paid to any thoughts of an upset early on and led 2-0 at the break. Borrowash really came at them in the second half, getting one back, but ultimately their first half performance let them down. This entry was posted in Groundhopping, Non-League, Travelog and tagged Atkinson Construction Bowl, Borrowash Victoria, Carlton Town, FA Cup, Non-League. Bookmark the permalink.